This past weekend, Florida was struck by two severe squall lines that flew through the state from west to east underneath the strong subtropical jet stream. These events only lasted 9-16 hours in duration, and compared to the midwestern and tornado alley outbreaks we are accustomed to seeing, these were relatively short events. The ferocity of the tornadoes and straight-line winds were comparable, and rank high on the list for “typical” Florida tornadoes that are often with winds less than 85 mph. There have been 8 confirmed tornadoes in 2016 so far. 6 in Florida (3 EF-2, 2 EF-1, and 1 EF-0). 2 deaths, 9 injuries in FL. Florida typically averages 3 tornadoes in the month of January over the last 30 years (SPC WCM page) and 59 tornadoes during a typical year. In addition, straight-line winds caused 1 injury. I’ll have more on the meteorology and climatology (and bonus: oceanography) of these tornadoes below, but I want to focus first on the human portion of this wave of severe weather. Most of this post will be dedicated to January 17th. Fortunately for most of us, we slept through the entire event as it occurred in west central Florida well before sunrise. Alarm clocks and Wireless Emergency Alerts (WEA) would have only corresponded in southeast Florida. In numerous news reports from Tampa Bay and Fort Myers, these WEA weather warnings were credited for saving lives. Prior to the event rolling ashore, the Storm Prediction Center (SPC) issued a statement at 11:03 PM ET saying that there was an 80% chance of a tornado watch during the overnight hours. This statement also pointed out that the highest risk was between Sarasota and Fort Myers. This discussion was in time to be aired on the nightly news in these areas, and thus may have been just as important as the tornado watch itself. The statement also relayed that a strong tornado or two was possible, something that came to be true. A concern of mine going into the event was that the jet stream, the fast moving river of air that guided this storm system into Florida, and a secondary low-level jet stream was incredibly low. This was picked up by the GFS model (and others) days in advance. These strong winds, in excess of the severe wind definition of 58 mph, dropped low enough to close the Sunshine Skyway Bridge twice. The Sunshine Skyway Bridge crosses Tampa Bay from St Petersburg to northwestern Manatee County. The bridge peaks at 430 feet, which is typically between 1005 and 990 mb. The 06z/1AM sounding during the event put this height at 987 mb. The bridge was closed for winds over 70 mph both as the squall line passed and during the late morning hours between 9:00 AM – 12:30 PM. This likely caused delays in morning travel, but could have been worse in working weekday travel. Home Failures. One of the other things I really wanted to bring to everyone’s attention is what some people did right and wrong in this event. As always, the lowest-level interior most room is the best place to shelter in place. 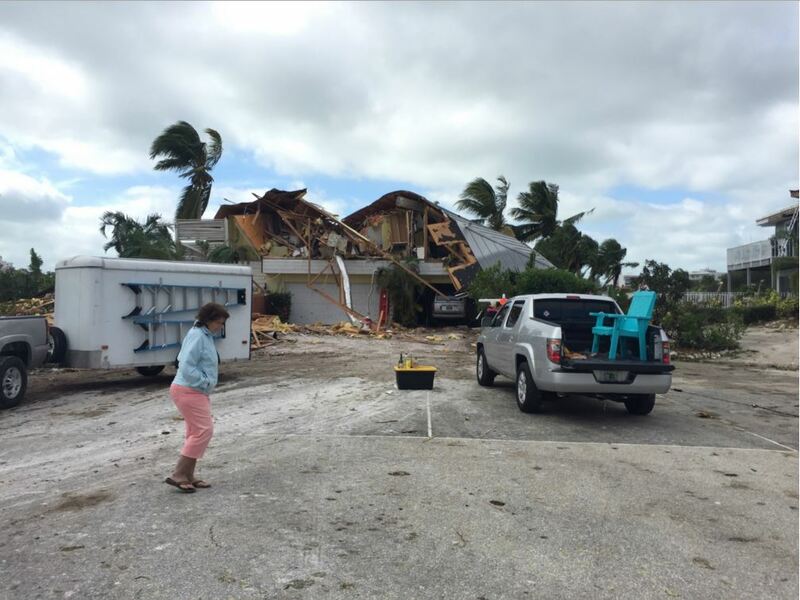 In Sarasota County, a two-story building was hit by a tornado. The second story of that building was largely destroyed by that tornado. Two people were pulled from that rubble. According to a WTSP report, the owner of the home was pulled from her second story bedroom. It took rescuers two hours to reach her due to the amount of debris. She survived with bruises and scratches. Others in the lower floor were largely unhurt. From @SRQCountyGov, 350 properties were inspected. Of those less than 45 were damaged. They estimate that the damage totals to greater than $3 million. WFTS-Tampa updated that number to $12 Million. More than 100,000 homes lost power during this event in Florida (Weather Channel). Nearly all of these power outages have been fixed at the time of this writing. The fatalities and most of the injuries that occurred with this outbreak occurred in a mobile home. 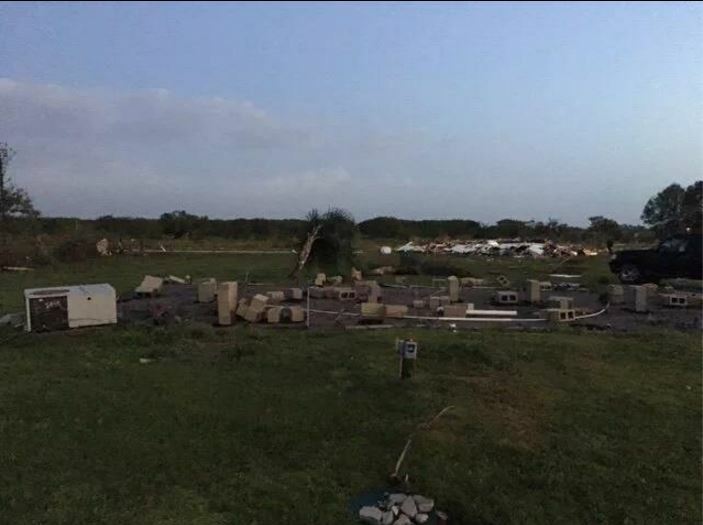 Per local reports, seven people were in a mobile home near Duette, FL when another EF 2 hit with 110 and 132 mph. Two of these people perished and four people were injured as that mobile home was moved off its foundation and across the street. Mobile homes are not safe to be in when any wind events, i.e. tornadoes, straight-line winds, or hurricanes, approach. They are called “Mobile” homes for a reason. A common theme in the damage pictures I have seen in the last week or so is that garage doors continue to be the weak point in a home. Without reinforcement, wind often enters through the garage door into the garage where it gets ‘stuck’. This wind and the added pressure has to go somewhere. With air still coming in through the now wide open garage opening it cannot go back out that way, so usually it goes up. I’ve seen evidence of both garages popping like a small explosion and garage roofs peeling off. Relatively cheap garage door reinforcement systems are available at home improvement stores such as Lowes and Home Depot. They could save your homes from major damage. This part of this post is not to pass blame on anyone, but rather to point out ways to survive and help reinforce your homes. Outlooks: The Storm Prediction Center (SPC) produced outlooks for this system three days in advance with a marginal risk, and two days in advance with a slight risk. The 1730z Outlook on the 15th outlined the exact area where the first mesoscale discussion on Saturday Evening pointed out the worst risk will evolve. Note that outlooks for two different “days” were released due to how SPC produces their outlooks. Their day begins and ends at 12z or 7 AM ET, in the middle of this event. Both verification reports are show below. 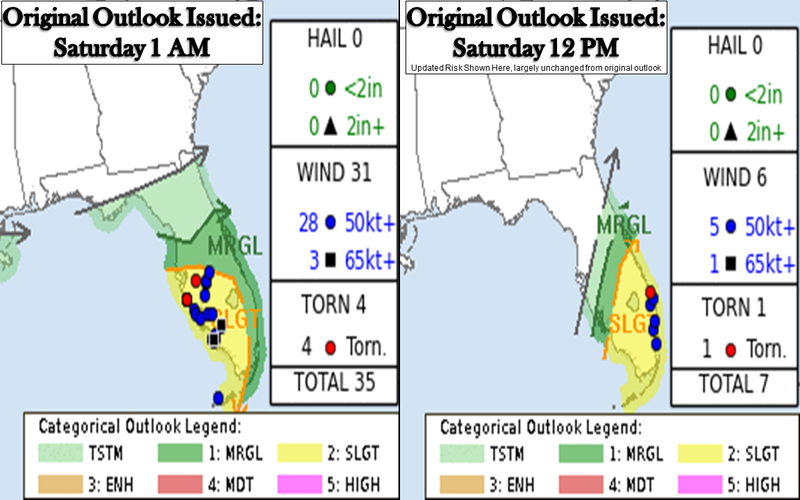 By original outlooks, I refer to the first slight risk issued for Florida on those given days. Note that the black boxes, or high wind reports, are that of hurricane force winds. In addition to the SPC Outlooks, I posted an impact graphic to twitter 10-12 hours prior to the event starting time with more details on the when and where of probable impacts. If anything, this impact graphic was not worded strongly enough. Warnings and Observations: This storm system developed around the Rio Grande Valley of Texas, pushed off the upper Texas coast and then quickly moved across the northern Gulf of Mexico with near hurricane force winds. The Weather Forecast Office in Tallahassee issued its first “Storm Warning” for the northeastern Gulf of Mexico, and the Tropical Analysis and Forecast Branch issued a similar warning for most of the deep Gulf of Mexico. 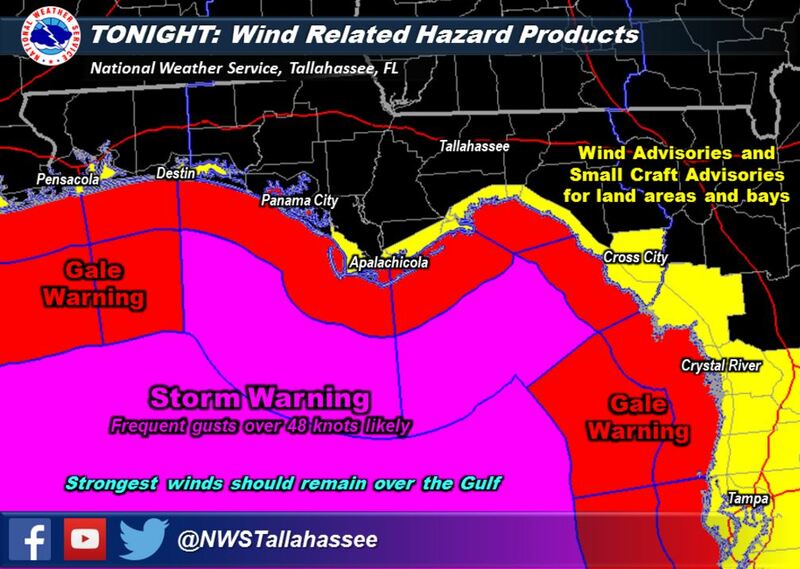 The warning from Tallahassee was the first and only warning of its kind from that office since at least the mid 1990’s. A storm warning is for winds gusting to near 55 mph. This warning verified according to Donald Van Dyke at the NWS. The low pressure center crossed Florida around the Nature Coast and crossed into the Atlantic on the First coast with rising pressures. The lowest pressure seen on Weather Prediction Center surface analysis was 996 mb. A substantial overlap in favorable ingredients occurred from Manatee to Collier County and into the Gulf in the pre-dawn hours. Some of these ingredients existed in Southeast Florida from St Lucie to Broward county and into the Atlantic. The Gulf Stream provided a coastal maximum in energy/CAPE [Convective Available Potential Energy] as storms rolled off the east coast. The event falls into the high shear/low CAPE category. I have analyzed some of these ingredients below, but with the caveat that I note that the maps I used were SPC Mesoanalysis. These maps are known to have small errors since hourly weather balloons are not launched. These are small errors that do not largely affect my analysis. In all of the graphics, I have noted the tornado and high wind events with stars and boxes, respectively, on the panels closest to the hour that they occurred according to NWS reports. Wind Shear: I knew going into the event days before that wind shear was going to be well beyond supportive for severe weather. Wind shear in this sense is defined as the wind speed difference between the surface and 1 kilometer in altitude. I looked in the lowest 1 kilometer of the atmosphere, where 15-20 knots of wind shear is typically supportive of supercell tornadoes. Numbers on Sunday morning were 2-2.5x that value as the storms pushed inland. Certain areas of the jet stream also help pull air upward to help stretch the entire atmospheric column through divergence and diffluence. This is somewhat analogous to a skater spinning faster as they bring their limbs inward and upward. Dew Point: It was also clear that moisture was going to be abundant around and ahead of the squall line. Interestingly enough, dew points plunged into the upper 40’s in Tampa Bay during the late evening and early morning hours before rain began to fall. As rain moved in, dew points rose into the 60’s in Tampa Bay, mid 60’s in southwest Florida, and 70’s in the Everglades and Keys. In the graphic below, the area south of the moderate emboldened line is an area with dew points at or above 65°F, and seems to be the cutoff line for where severe weather did not pass. The advection of Theta-E (a moisture/temperature variable) maximized at 6+°C/hr along the northern suncoast at around 3 AM. This is fairly robust moisture transport in the eastern Gulf that fed these storms. From that time on, moisture transport quickly weakened and ceased to exist on land by 6 AM. Energy: A BIG question going into this event was if there was going to be enough energy to fuel storms. 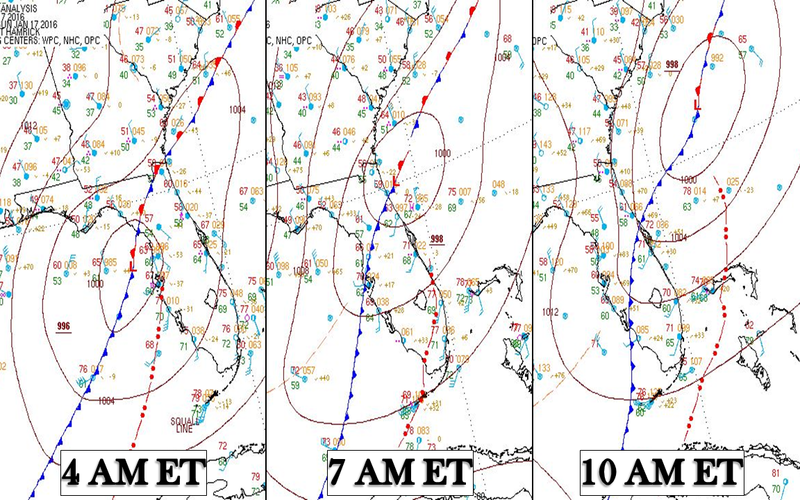 Model run after model run dotted a gradient of 100-500 J/kg along and just offshore the Suncoast. 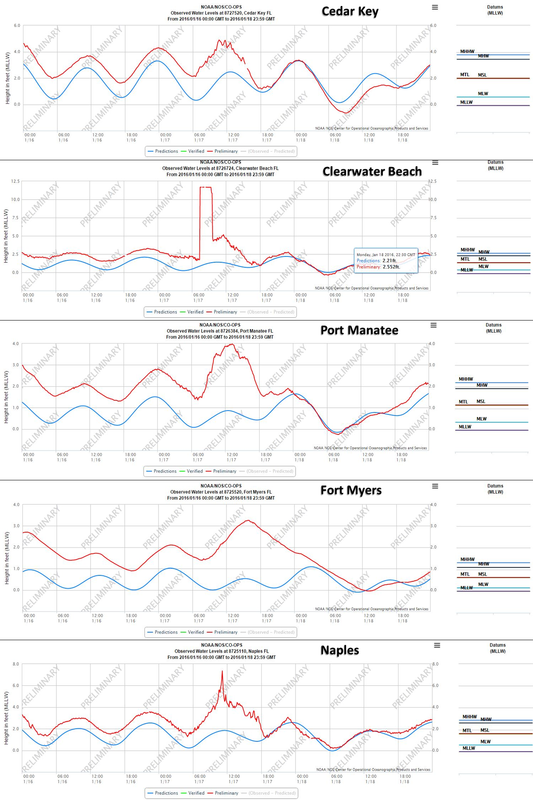 A few models even brought CAPE values of upward of 1000 J/kg into the Port Charlotte/Cape Coral and Naples metros. Thankfully that did not pan out. Higher values are associated with stronger storms. In this case, the overabundance of wind shear helped pick up the slack in ingredients for what CAPE wasn’t there. Had energy levels been higher, we would have been looking at a considerably higher outlook and worse outcome. The storm system on January 15th and the quick following of this one may have limited energy values. There were three significant tornadoes that came with this robust low pressure system. Two strong tornadoes and one moderately destructive tornado resulted. 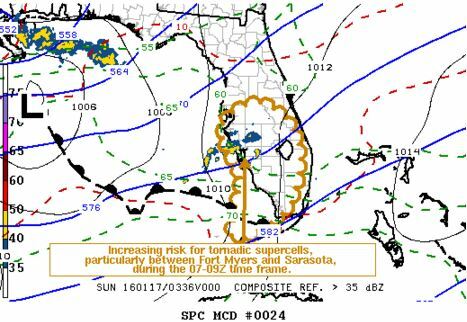 Two rare “particularly dangerous situation” tornado warnings were issued by NWS Tampa Bay. 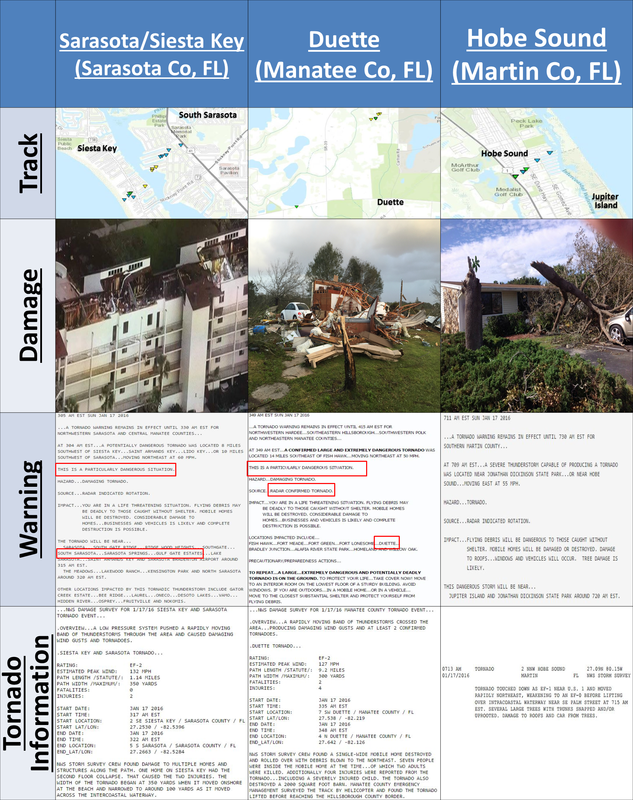 Tornado Tracks, Pictures Warnings, and Reports (NWS Tampa Bay and NWS Melbourne, @WFLA); Click this graphic, large graphic! The Wind Damage: There were plenty of wind damage reports across the southern two-thirds of Florida as well. I have chosen to include Hardee/DeSoto counties and the Naples area in this post because these two areas had an injury and substantial damage. In particular, the Naples area got rather lucky even with a large swath of damage. Radar imagery showed an area off the coast that was suggestive of a waterspout, soon to be tornado. 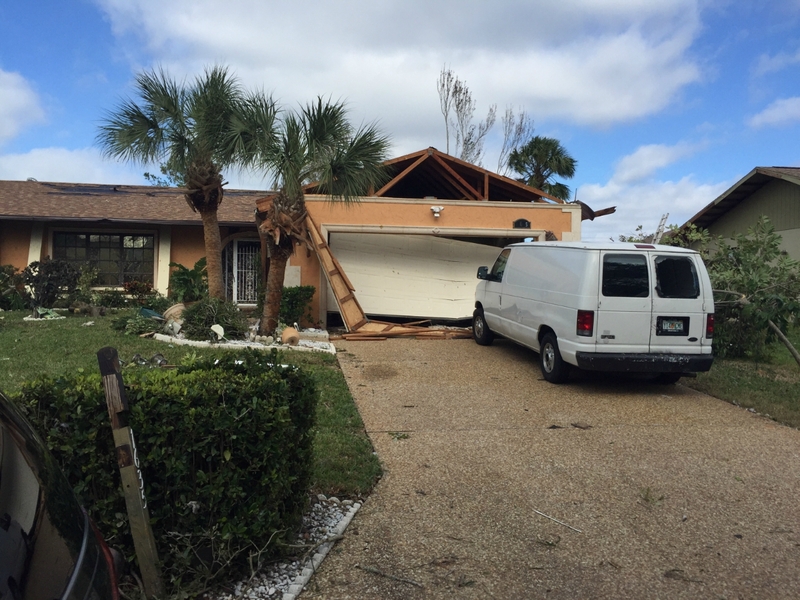 No tornado was confirmed, but extensive wind damage was found in Collier County. At Naples Airport, winds gusted similarly during this event and Hurricane Wilma in 2005 (84 vs 82 mph). At Naples Pier, winds were weaker in this event (60 mph vs 102 mph in Wilma). Five severe winds were recorded in the Naples area alone. 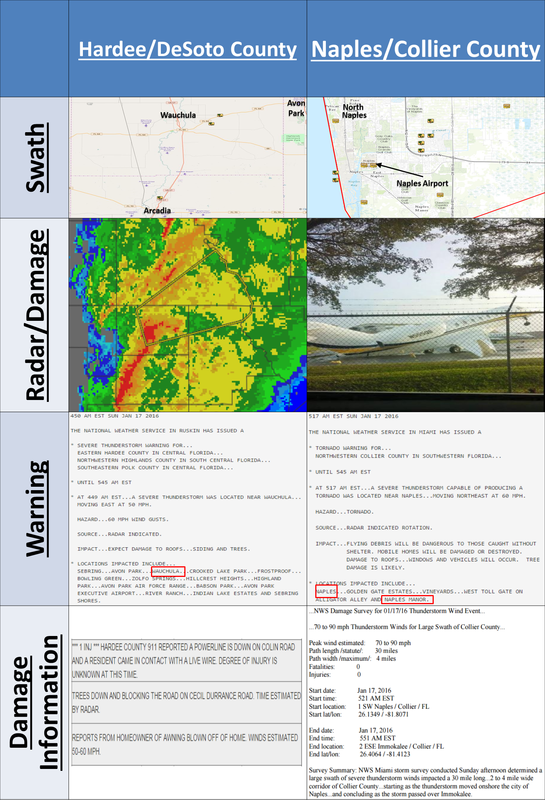 Two selected damaging wind reports (NWS Tampa Bay, NWS Miami, and John Patrick – Naples Airplane); Click this graphic, large graphic! Along with this squall line and the damage reports in the Naples area, there was also a “meteotsunami” along the Naples coast. A meteotsunami is essentially a tsunami that is caused by weather…in this case the squall line and severe winds. Open up the graphic below, and you’ll see that prior to 12:00 GMT or 7 AM Eastern all of the stations recorded tidal surges. This is roughly the time that the cold front and squall line arrived along the west coast. Surge isn’t all that uncommon along the west coast of Florida with weather listed as the cause. Typically we bring up storm surge in the case of hurricanes, but it is common with strong cold fronts as they move eastward across the Gulf of Mexico or even with robust onshore winds. Why is this event noted with a different name? Note that in the top four panels, water surged 1/2 ft to 2 ft from Saturday night to the time the cold front arrived. The Clearwater Beach jump is a glitch but data before the box signal is useful. Surge was noted along the entire west coast of Florida. At Naples on the bottom however, the water level subtly rose about a half foot in the first tidal cycle and then jumped 4 feet from the second crest to the third. The sharpness of this rise and fall suggest that a meteotsunami was likely the cause. A 4 millibar rise was noted just prior to this meteotsunami as well. See the articles below for why this pressure change is important. This sharp rise in water level is what sets this meteotsunami apart from just surge. I am in no way an expert in these meteotsunamis, and in fact, I only heard of this term a couple of years ago. In that time this is the first ‘real world’ example I have seen, although I am very sure there have been some that I have missed. I know that NWS Tampa Bay did a talk at the annual AMS meeting in New Orleans earlier this month. For more on the science and a little rub a dub dub, head over to this Wunderblog by Lee Grunci. Dr. Marshall Shepherd also has a fantastic article on Forbes about this event here. The main reasons that I wrote this summary were to, if nothing else, teach about the impacts of weather and about the meteorology itself. This system was particularly well forecast and well warned. Even still, we lost two grandparents in a mobile home. This tells me that we still have a lot of work to do both in the warning and in the communications stages of severe weather. As the map below shows, there will always be damage, tornadoes, and high winds. That we will not be able to control. What we can control is how we as humans prepare, mitigate, and respond to those events. It is our job as humans to prepare and be aware of the weather as it comes at us. Please have at least two ways to receiving weather alerts at all times and keep your eyes on the sky often. There’s a decent possibility of more strong storms this winter and spring. Be Prepared. Be Aware. Be Safe. Posted on Tuesday, January 19th, 2016, in Florida Weather, Severe Weather. Bookmark the permalink. Leave a comment.